Smartfish Introduces anti-gravity comfort for your computer mouse — the Whirl Desktop's patented ErgoMotion pivot system makes your mouse feel like it's "floating on air!" For Desktop use, it’s time to get rid of that old-fashioned “laser mouse” and upgrade to the comfort of the Whirl Desktop Mouse with ErgoMotion -- the world’s first truly ergonomic desktop mouse. No other desktop mouse provides the fluid, air-like comfort of the patented ErgoMotion pivot system. ErgoMotion is a revolutionary technology that applies motion to experiences, a solution that actually reduces the risks of Repetitive Stress Injury (RSI). The ErgoMotion Laser Mouse challenges other “fixed position” mice by utilizing a patented pivot base that adapts to your natural hand and wrist movements. 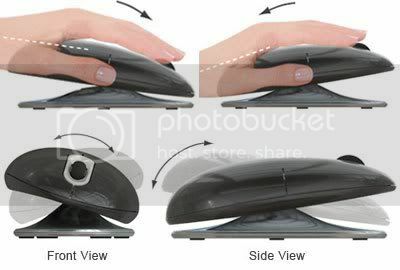 The mouse conforms to your unique positions, alleviating discomfort and encouraging productivity while you work. The ErgoMotion Mouse connects wirelessly to your computer using 2.4GHz USB nano-tranceiver. No software is required. The nano-tranceiver is an intelligent plug-and-play device that provides instant and uninterrupted connection, wire free. The nano-tranceiver is also small enough to leave plugged into your laptop so you are ready to mouse all the time, wherever you are. Saving battery life is easy enough by switching the power on/off while traveling. The Smartfish Whirl Laser Mouse with Anti-Gravity Comfort Pivot can be purchased directly from Smartfish online store or on Amazon.com. Disclosure: I received sample products from Smartfish Technologies at no charge in exchange for a review of my opinion. The opinions expressed are my own personal and honest thoughts. No other compensation was given.